Where to start? Well, I'm sitting writing this blog whilst warming up next to the gorgeous, cosy fire in our 'room' which would definitely be described as a luxury one-bed apartment if we were back in London. We've had 2 absolutely fantastic days of golf - we've had stunning views and a truly memorable golf experience. The first day was spent at the tricky Spyglass course where the wind was really 'blowing a houlie' - the views from the first 4 holes were completely breathtaking. The fact that we virtually had the golf course to ourselves - Stu described it as 'billionaire's golf' - was an unexpected bonus and certainly gave us the opportunity to really take the time to appreciate the beauty of everything around us! A hot toddy sitting around the cosy fires on the hotel terrace listening while to the sound of lone bag-piper - blankets a must and thankfully in plentiful supply! - was the perfect way to end the round. 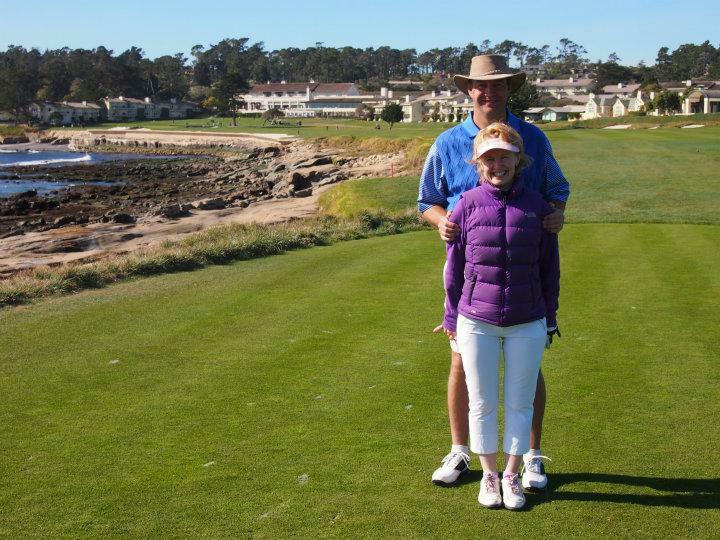 Today, we were blessed with the opportunity to play the Pebble Beach course. Thankfully, the winds were a little less strong today and the views even more stunning. We also had the luxury of a caddy, Larry, who kindly helped us navigate ourselves around the course. His advice, especially on the lightening quick greens, was invaluable. Thankfully, I somehow managed to play my best golf for a very long time despite some pretty challenging holes - I think I actually parred 4 holes which I was very chuffed about. I even managed to beat Stuart - yippee! - well at least in terms of Stableford points. It's just a shame I can't take Larry back home with me to Banstead ... am sure my handicap would come tumbling down! The service here has been truly amazing. Everyone we have met has been so helpful, friendly, happy and given the impression that they are extremely proud to work here. It's an incredibly special place and definitely somewhere I would love to come back to, maybe in a year or two when Stu and are due to celebrate our 50th birthdays? Now I really do have an incentive to come back home and get back to work! Sad to say we've actually reached the final night of our 5 week trip. Tomorrow we plan to hire some bikes and cycle along the stunning coastline path - known as the '17 mile drive' although it's actually only 13 miles! - before we leave for the airport. It's hard to believe that we have been away for so long. Thank you very much to those of you that have followed our journey. Hope this blog has enabled you to share some of the special times that we have had and maybe inspired you to plan a trip of your own. If so, I hope you have as wonderful an experience as we have had.